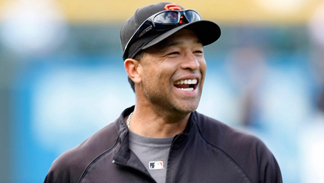 Dave Roberts will be hired as manager of the Los Angeles Dodgers, a person familiar with the decision told The Associated Press. The person spoke on the condition of anonymity Sunday night because the team hasn’t announced the move that is expected Monday. Roberts is a former Dodgers outfielder who will be the first minority manager in the storied franchise's history. His father is black and his mother is Japanese. The 43-year-old most recently served as bench coach of the San Diego Padres since 2011. Roberts played for the Dodgers from 2002-04 during his 10-year big league career. He also played for Cleveland, Boston, San Diego and San Francisco during his career that ended in 2008. Roberts was a career .266 hitter with 243 steals. He will succeed Don Mattingly, who mutually parted ways with the team last month after five years that included winning three consecutive NL West titles but never reaching the World Series. A week later, Mattingly signed a four-year contract to manage the Miami Marlins. One of the favorites to replace Mattingly was Gabe Kapler, the club's farm director. He played with Tampa Bay when Andrew Fried­man, the Dodgers’ president of baseball operations, was that club's general manager. The franchise also interviewed Dodgers bench coach Tim Wallach and third base coach Ron Roenicke, who has since joined the rival Angels. Others interviewed included Kirk Gibson, a hero in the Dodgers’ 1988 World Series championship; Nebraska baseball coach Darin Erstad; former Padres manager Bud Black; and Cubs bench coach Dave Martinez. Roberts is perhaps best known for his stolen base in the 2004 AL playoffs that sparked the Red Sox to an elusive World Series championship. In the AL Championship Series, Boston was three outs from being swept by the New York Yankees. Roberts pinch-ran after Kevin Millar drew a leadoff walk from Mariano Rivera. Roberts stole second and scored on Bill Mueller's single. Boston won 6-4 in 12 innings, then became the first team in major league history to overcome a 3-0 deficit and win a postseason series. Roberts did not play as the Red Sox swept St. Louis for their first championship since 1918, but will always be beloved in Boston because of that one play. In 2011, Roberts survived a bout with Hodgkin's lymphoma. Roberts was born in Okinawa, Japan, where his father served with the U.S. Marines. The Dodgers last won the World Series in 1988. They lost 3-2 to the New York Mets in a decisive Game 5 of the NL Division Series this season, having made the postseason in three straight years for the first time in franchise history.